Gus is a 10-year-old red male born February 6, 2003. His sire is Legs Patriot and his dam is My Pixie. 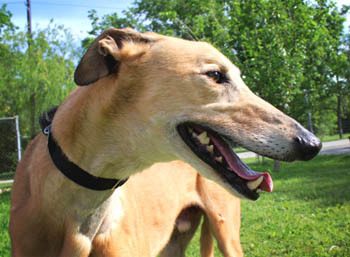 Gus has no racing record on Greyhound-data.com. 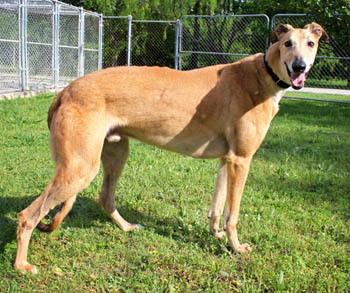 This handsome fellow is looking forward to a successful search for his forever home! Gus is not cat tolerant, but he is living with three small dogs in his foster home. This 9-year-old beauty is an all-around good sport. First clue is that he lives quite amicably with three terriers. He is happy to walk, happy to eat in his crate. He's calm, and not especially vocal. Though "playful" wouldn't be in the Top 10 list of adjectives to describe him, he's not averse to shaking or tossing rope toys into the air. He also has an affinity for shoes, which, when told "no," he releases to their rightful owner. Gus (gotta love a dog named Gus!) sleeps in his crate, spending about seven hours there every night. That's where he takes his meals, too, and though he has a healthy appetite (supplemented, please, by treats and rawhide chews), he is not one to counter surf. 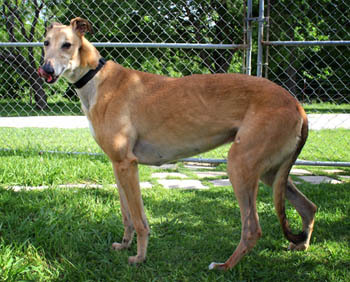 He likes to romp in the yard, so would do best in a home with a space outside to run around and play. No need for his forever family to constantly be opening and closing the door for him; he is quite adept at using the dog door. Gus would do well as an only dog, and even as an only pet. With his temperament and intellect, he'd also make a good therapy or obedience dog. And though he likes having his people around him, he's not one to stay glued to their side. He, like most of us, just likes to know someone he loves is close by.